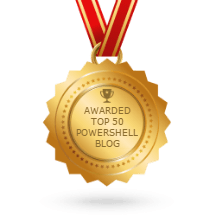 PowerShell is a very simple scipting language, designed for IT administrators who aren’t used to scripting and programming stuff. Reiterating it “Powershell is designed to make IT Admins able to script just with basic understanding of programming”. So, there is no point to fear the shell because it is designed to ease the life of Windows Administrators because we already have many upcoming technologies and lot to learn at our job, so it has to be simple. Most of the powerhsell logic is written in .net and C# leaving the powershell cmdlets very small and easy but powerfull. Why to use Shell, when we can use GUI? Well Graphical interface definitely makes your life easy, but most of the time problems are in real time and solutions are required at instant, and depending upon Microsoft or a third party to design a GUI solution for our problem can be time and resource intensive. Microsoft doesn’t understand issues and problems you face in your environment. Hence, Powershell was designed in order to take power from vendor to the administrators, enabling them to create solutions independently. Thank you my friend . I am fully new to powershell and I want to make scripts in my company and be the best in it . I am going to start my campaign from your website and will finish every chapter with interest .